These items are unique in the world of animal jewelry! Made in Washington and Idaho by a team of three U.S. artists, these high-quality pins or tie tacks are exceptional. Each exquisitely detailed piece is cast in pewter and painted by hand. The finish is extremely smooth and shiny. Each pin is secured by two sturdy tacks on the back so it doesn't skew sideways or turn upside down, and the finished product is not only gorgeous, but satisfyingly substantial in weight. 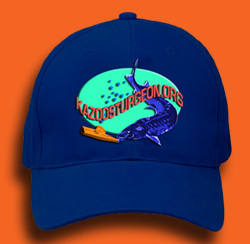 They can be used as lapel pins, hat pins, tie tacks, and more. These collectible animal pins are heirloom quality, and the details are very realistic. 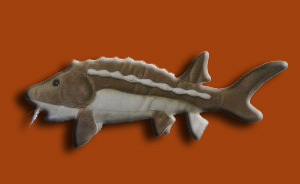 Our adorable, realistic stuffed sturgeon plush toys are 10 and 17 inches long from nose to tail. They have lovely gray brown head and back, yellow ochre sides, light gray fins and a soft white belly and barbels. 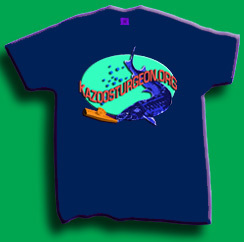 They are filled with bean composite and sewn of soft fabric. Our sturgeon have a kind and gentle expressions. Making for thoughtful child's toys or stuffed animal collections.